Free Delivery to Tampa; Pirate Festivaaaaaaal! Hello there, matey. If you are a restaurant owner in Tampa or have been thinking about opening up your own restaurant in Tampa, then come to One Fat Frog Restaurant Equipment and let’s do some business! One Fat Frog Restaurant Equipment has been supplying Tampa and Tampa area restaurants for several years, while also offering FREE delivery to Tampa and the Tampa area! 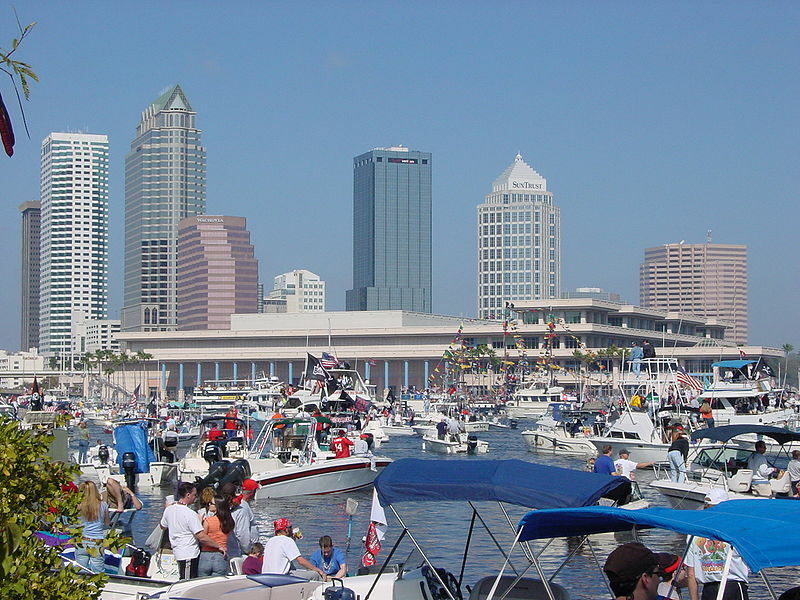 Tampa is a vibrant city and home to several annual and special events. Here’s a look at some of the events held in Tampa, Florida. Perhaps the most well known and anticipated events are those from Tampa’s annual celebration of “Gasparilla”, particularly the Gasparilla Pirate Festival, a mock pirate invasion held since 1904 in late January or early February. Often referred to as Tampa’s “Mardi Gras”, the invasion flotilla led by the pirate ship, Jose Gasparilla, and subsequent parade draw over 400,000 attendees, contributing tens of millions of dollars to the city’s economy. Beyond the initial invasion, numerous Gasparilla festivities take place each year between January and March, including the Gasparilla Children’s Parade, the more adult-oriented Sant’Yago Knight Parade, the Gasparilla Distance Classic, Gasparilla Festival of the Arts, and the Gasparilla International Film Festival, among other pirate themed events. Other notable events include the Outback Bowl, which is held New Year’s Day at Raymond James Stadium. Each February, The Florida State Fair brings crowds from across the state, while “Fiesta Day” celebrates Tampa’s Cuban, German, Italian, African-Cuban, Jewish and Spanish immigrant heritage. In April the MacDill Air Fest entertains as one of the largest military air shows in the U.S.. Guavaween, a nighttime street celebration infuses Halloween with the Latin flavor of Ybor City. Ybor also hosts “GaYbor Days”, an annual street party in the GLBT-friendly GaYbor district. The Tampa International Gay and Lesbian Film Festival, held annually since 1989, is the city’s largest film festival event, and one of the largest independent gay film festivals in the country. Methinks the One Fat Frog Restaurant Equipment delivery crew should cleverly coincide one of their free delivery runs to Tampa with one of those great events in Tampa. Even the One Fat Frog Restaurant Equipment needs some fun sometimes! The One Fat Frog Restaurant Equipment free delivery run from Orlando to Tampa happens every few weeks, so be sure to come into One Fat Frog Restaurant Equipment and find out the dates, then purchase all of the used commercial restaurant equipment you need for your Tampa restaurant! Truckloads of used commercial restaurant equipment is coming in every week, so check One Fat Frog Restaurant Equipment often for the best deals on the restaurant equipment you need. Here’s a brief look at what you can find in the massive One Fat Frog Restaurant Equipment warehouse: used range ovens, used convection ovens, used conveyor ovens, used cook and hold ovens, used flat griddles, used char broilers, used walk-in freezers, used walk-in coolers, used commercial freezers (single, double, triple door), used commercial coolers *single, double, triple door), used prep tables, used refrigerated chef bases, used slicers, used kegerators, used bottle coolers, used under counter dishwashers, used stainless steel tables, used restaurant furniture, used fryers, used hot plates, used heating lamps, used commercial toasters, and even used smallwares! One Fat Frog Restaurant Equipment is happy to supply used commercial restaurant equipment for Tampa restaurants, Tampa bars, Tampa bakeries, Tampa food trucks, Tampa pizzerias, Tampa cafes, Tampa churches, Tampa returement homes, Tampa country clubs, and any other place in Tampa that requires high quality used restaurant equipment. One Fat Frog Restaurant Equipment can get you financed if you are just starting out in Tampa or even if you have been established for years in Tampa. One Fat Frog Restaurant Equipment also welcomes quick cash deals and package deals to Tampa restaurant owners. One Fat Frog Restaurant Equipment can get you equipment financing no matter what shape your credit is in. One Fat Frog Restaurant Equipment also offers free delivery to Gainesville, Jacksonville, Ocala, St. Augustine, Lake City, as well as Tampa! Come into One Fat Frog Restaurant Equipment and get all the financing and equipment you need for your Tampa restaurant!